For those children of the 70’s and 80’s you might best remember Judith Viorst from her fantastic book, “Alexander and the Terrible, Horrible, No Good, Very Bad Day.” This was a staple of my reading life as a child – and I repeatedly checked this book out from my school library – just adoring the fact that a child could actually admit that stinky things happen sometimes. 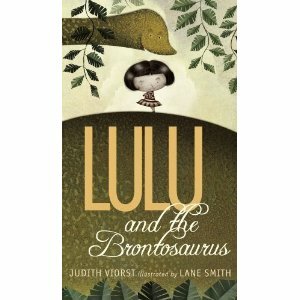 Viorst has a knack for creating tales that are refreshingly honest and appealing to children and her book “Lulu and the Brontosaurus” is no exception. Lulu is awfully awful. For lack of a better term, she’s a brat. And used to getting exactly what she wants. But when what she wants is a Brontosaurus, her parents have to draw the line. So Lulu revolts with a hearty “foo on you” and skips town armed with pickle sandwiches (yum!). Ironically, guess who she finds in the forest? Yep – a Brontosaurus…who wants HER as a pet. You can’t resist this adorable story, complete with illustrations by the inimitable Lane Smith. So grab a pickle sandwich and settle right in with this delightful chapter book.